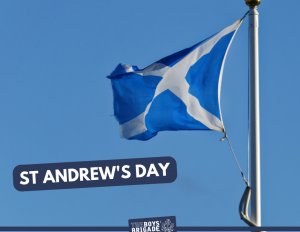 One of the 12 Apostles, Saint Andrew is also Patron Saint of Scotland. This Friday (30 November) is Saint Andrew's Day, so why not include some of the following ideas in your programme? Find out more about a famous Scot - like Sir William Alexander Smith! St Andrew is also Patron Saint of Greece and Russia? He was crucified on an X shaped cross and that's how it appears on the Scotland flag! The Boys' Brigade began in Scotland in Glasgow on the 4th October 1883! The town of St Andrew's is also known for being the home of Golf! How are you celebrating? What programme ideas have worked well in your section?